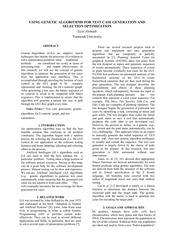 This PDF 1.6 document has been generated by ILOVEPDF.COM, and has been sent on pdf-archive.com on 23/08/2015 at 15:07, from IP address 103.5.x.x. The current document download page has been viewed 275 times. File size: 644 KB (17 pages). to the problem is reached. improvements from a starting configuration. 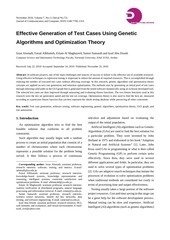 LIKE dynamic programming, greedy method solves optimization problems. The problem is stated as below. There are n jobs to be processed on a machine. Each job i has a deadline di≥ 0 and profit pi≥0 . Pi is earned iff the job is completed by its deadline. The job is completed if it is processed on a machine for unit time. Only one machine is available for processing jobs. A feasible solution is a subset of jobs J such that each job is completed by its deadline. An optimal solution is a feasible solution with maximum profit value. job sequence J is a feasible solution.  = (i1,i2,….ik) be a permutation of jobs in J such that di1 ≤ di2 ≤…≤ dik. violating any deadline then J is a feasible solution. the jobs may be processed. i.e. dr1 1, dr2  2, …, drk  k.
each job requiring an unit time. Assume  1  . Then let a be the least index in which  1 and  differ. i.e. a is such that ra  ia. Let rb = ia, so b &gt; a (because for all indices j less than a rj = ij). In  1 interchange ra and rb. We know di1  di2  … dia  dib …  dik. Since ia = rb, drb  dra or dra  drb. the least index in which 11 and  differ is incremented by one. Also the jobs in 11 may be processed without violating a deadline. Continuing in this way, 1 can be transformed into  without violating any deadline. Let n be the number of jobs and s be the number of jobs included in the solution. The loop between lines 4-15 (the for-loop) is iterated (n-1)times. Each iteration takes O(k) where k is the number of existing jobs.  The time needed by the algorithm is 0(sn) s  n so the worst case time is 0(n2). D and J need θ(s) amount of space. Question: Why can‘t we use BRUTE FORCE method in constructing MST ? Answer: If we use Brute force method• Exhaustive search approach has to be applied. 1. The number of spanning trees grows exponentially with graph size. 2. Generating all spanning trees for the given graph is not easy. • Construct a series of expanding sub-trees T1, T2, … Tn-1. This file has been shared by a user of PDF Archive. Document ID: 00297360.